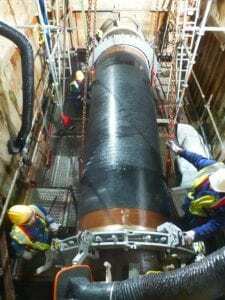 Westfall’s Ultra Low Headloss Pipeline Mixer 3050 series provide full pipe mixing that generates 2 to 4 times less headloss than other static mixers. Fatigue Life Analysis studies show these motionless mixers will last more than 40 years. Four tapered and curved vanes with precisely designed geometry are welded around the pipe interior and invert flow to rapidly mix liquids or gases. 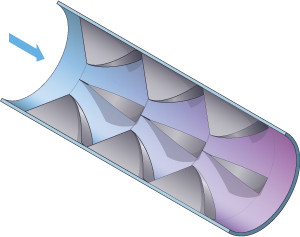 The addition of a second stage of vanes aligned downstream of the first row creates additional vortices that overlap in a braiding effect. 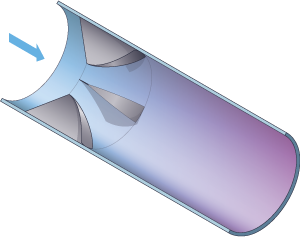 According to CFD analyses conducted by Alden Laboratories, the vane stages provide a CoV range from .057 with one stage to a CoV of .014 when all three are installed. Headloss is 0.58 for one stage, 1.13 for a 2-stage version and 1.64 for the 3-stage mixer. Small versions of this mixer (3/8″ to 5″ or 0.95cm-12.7cm), which are too small for custom fabrication, are now made via 3D printing and glued inside a pipe. This installation for a natural gas pipeline in Germany runs beneath an environmentally sensitive marshland. The 3050 mixer was chosen because of its low maintenance and durability, as well as its effective mixing capacity. 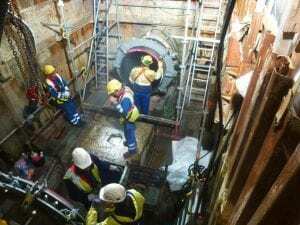 When the incoming and outgoing pipes were ready, the 48″ Westfall unit was lowered into place and welded at both ends. Because the natural gas came in to this pipeline from 4 different wells, the Westfall Static Mixer 3050 was chosen to blend the gases of varying densities, compositions, temperatures and flow rates prior to customer delivery. CFD and FEA tests conducted in the US and Germany indicated that this mixer will yield a service life of more than 40 years. Vanes for Low Headloss Pipeline Mixer 3050 prior to welding in place. Inside Westfall’s Low Headloss Pipeline Mixer Model 3050 are 4 of these vanes precision welded around the pipeline interior. 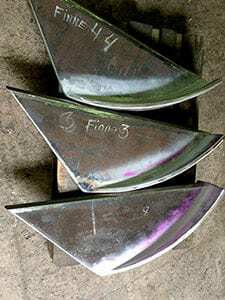 For more mixing (depending on the amount of headloss tolerated), a second and third row of 4 vanes can be added. 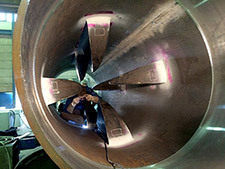 The leading or upstream edge of each vane is angled 45 degrees to resist fouling. 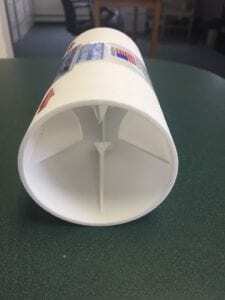 The downstream edge is flared outwards to create a T-shape, which sends the incoming water or gas into swirling vortices that rapidly swirl counterclockwise out to the pipe edge and back again to the center. Whether blending gases from different wells, or mixing additives to purify wastewater, the patented Westfall vanes deliver full mixing in less than 10 diameters. Westfall has pioneered the manufacture of small size Static Mixers, specifically their Low Headloss Pipe Static Mixer 3050, by 3D printing their patented mixer of durable nylon and gluing it into a PVC pipe. Westfall engineers know that whether the materials used were metal, fiberglass or 3D printed nylon, the mixer’s high performance wouldn’t change. If the geometry stayed the same the hydrodynamics would be the same.